… and not one I’ve ever seen before. Love its ginger back and its furry yellow bum. 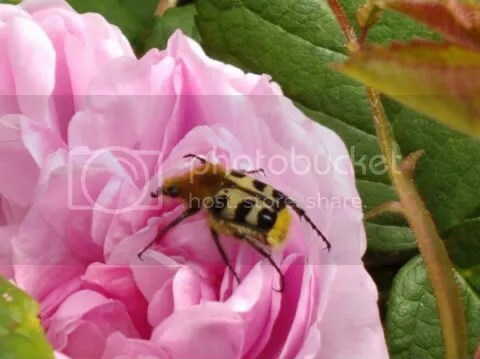 Searching through insect books it turns out that it is a bee beetle – Trichius fasciatus – and is rare in the UK… and not that usual here either. It is about 1 cm in length and usually found on roses (which is was) and thyme – and we have plenty of that but haven’t seen them on the thyme flowers. Apparently the wing cases can vary from the pale lemon yellow of this specimen to a deep orange.